General Discussion This area contains general discussion regarding the Toyota FJ Cruiser that does not fit into the other technical discussion forums. Toyota FJ Cruiser Forum > Toyota FJ Cruiser Discussion > General Discussion > What did you buy today (FJ related items)? What did you buy today (FJ related items)? 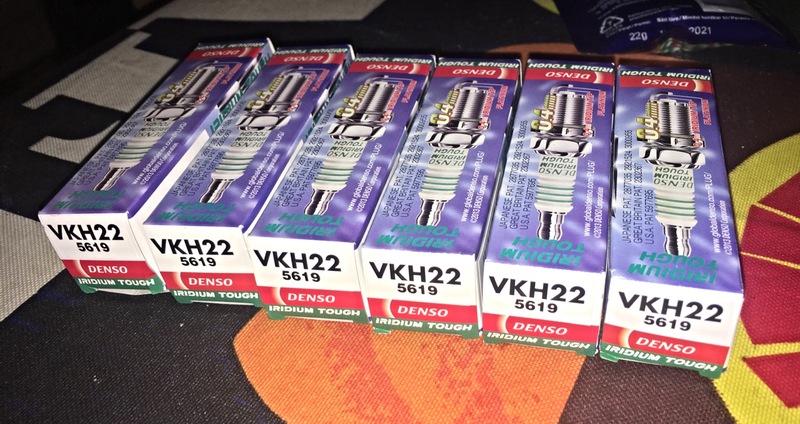 Denso Iridium Tough VKH22 plugs. FJFool, Lee44, Jkinabru and 2 others like this. Re: What did you buy today (FJ related items)? I didn't buy anything today, but I did receive my waterport today! It's a 3.3 gallon water release tank. Still need to fab a mount for it. Lee44 and cocoloto like this. Bought some engine treatment stuff to add to my next tank of gas. Never used it before but figured after 100,00 miles I might as well give the faithful FJ a treat. I keep looking at possible parts to buy to improve my FJs front end suspension. Specifically new LCAs and cam alignment bolts. Any suggestions on cam bolts? I've got my eye on those Moog cam bolt kits with the greasable zerks. BOBTAILFJ, Thorn661, FJFool and 2 others like this. Just dropped my LCA on Monday and the inner bushings to frame have seen better days. I definitely need to replace those. Anything wrong with stock cam bolts? Are the moog ones for poly bushings? Air gauge since I couldn't find mine at the Florence Beach run. GammaBruiser, FJFool, Irving Zisman and 4 others like this. ZerosFJ, amaclach, FJFool and 5 others like this. A/C clutch relay. $25 with shipping on Ebay. BOBTAILFJ, bazross and Lee44 like this. ZerosFJ, FJou..., amaclach and 5 others like this. This is a very bad thread for my wallet. FJou..., amaclach, debFJVT and 7 others like this. bazross, Shazzam15, Lee44 and 1 others like this. "It's not easy being Green"
In order to be able to post messages on the Toyota FJ Cruiser Forum forums, you must first register. The Toyota Supra is Going Racing in NASCAR?